Home to some of the most beautiful architectural structures that reflect the grandiose of the Nizams, the newly formed state of Telangana is known for its rich culture. In the recent years, especially with the boom in the IT industry, many MNCs have come up in its capital city, Hyderabad and other popular cities like Warangal, Medak etc. This has led to multitudes of people migrating to the city in search of jobs and opportunities. And this ultimately led to huge demand for rental properties. 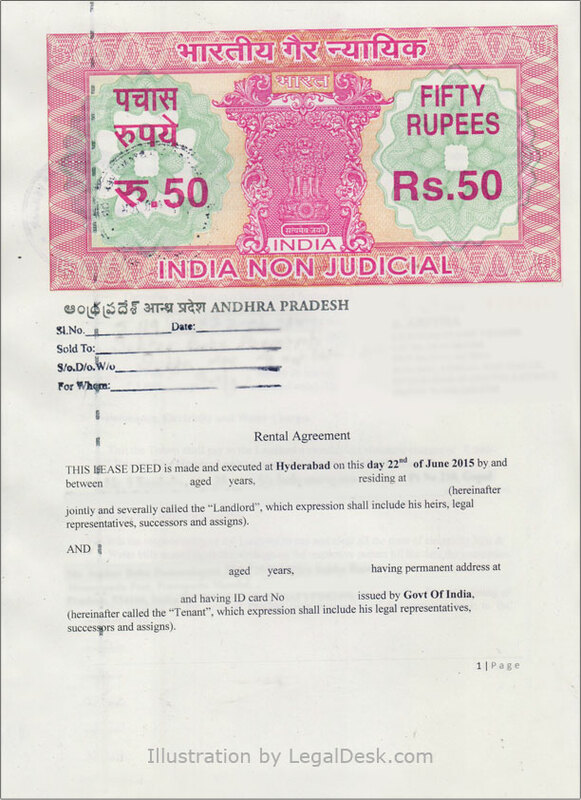 Which brings us to the topic under discussion – How do you make a rental agreement in Telangana. Here’s how. The first step in preparing a rental agreement is to discuss necessary clauses that should be included. Both landlord and tenant can negotiate the clauses and decide what goes into the contract. Once the clauses are finalized, a deed is drafted and reviewed by both parties. Keep in mind that there are some vital clauses like monthly rent, deposit, lock-in period, maintenance charges and several others which just should not be omitted. The next step would involve purchasing stamp paper of recommended value and printing the prepared draft on it. The tenant and landlord must then place their signatures at designated places in the contract in the presence of two witnesses, who also sign the deed. The contract is then registered at the local Sub-Registrar office. Now you can use our Online Rental Agreement service if you don’t have time to do all this yourself. e-Stamping is yet to be prevalent in Telangana, so for now, people are dependent on conventional stamp papers. However, there is a good chance that e-Stamping will come in to being in the near future. Registration charges for rental agreements in Telangana and Andhra Pradesh are charged at 5%. While appearing for registration of the rental agreement, both tenant and landlord may have to produce documents that prove their identity, title of ownership (landlord), passport size photos etc. 11-month rental agreement – This is the most commonly used type of rental agreement throughout the country. The term of such a contract is eleven months post which both parties can mutually agree to renew/ terminate the contract. Registration is not mandatory for such agreements and are usually overlooked. Long term lease – Signed for both residential and commercial purposes, long term leases involve durations that last in years. In most cases a lump sum is paid upfront and this sum is later returned to the tenant at the end of term. Skipping out on certain vital clauses in your rental agreement most likely leads to legal battles should a disagreement arise between the two parties. Which is why everyone says that a rental agreement should always be in place even if the parties involved are the closest. Rent, maintenance charges and security deposit – Charges for each must be clearly spelled out in the contract to prevent both parties from breaching the contract. Pets – Landlords who cannot entertain animals in their property must make this very clear to the tenant through the contract. Penalty for late payments – In most cases, landlords are free to levy a fine on delayed rent payments. Details about such fines must be clearly stated in the deed. Cleaning and painting – If Landlord cleans and paints the property under discussion before the Tenant moves in, the charges for the same can be deducted from deposit paid by the Tenant. So the deed must clearly state that charges for painting and cleaning will be cut from the security deposit. Consequences of overstay – If the Tenant refuses to vacate the property even after the contract has ended, Landlord can decide the penalty for it. Such a penalty should be detailed in the deed. Payment receipts – Collect receipts for your token, security deposit and even your monthly rent. Be pushy about it if need be. Painting and maintenance – It is a common trend among Landlords to deduct one month’s rent as painting charges from the security deposit. While this is a valid deduction, the Tenant should know that if the property was not painted freshly for him, then the landlord cannot deduct painting charges. Security Deposit – Security deposit is a few months worth of money, collected in advance from the Tenant to avoid losses to the Landlord due to various reasons like non payment of rent or damages to the property. This is a refundable amount and that fact should be spelled out in the contract. The amount collected varies from city to city. In bigger cities like Hyderabad, Vijayawada etc it could be greater than in cities like Guntur, Nellore and Warangal. Token Advance – Token advance too is a small sum of money paid to the Landlord before even the contract is drawn up. This serves the purpose of blocking the house from other potential tenants and thereby taking the house off the market. Payment of the token advance also considers the deal sealed and if either party backs out, he/she is responsible for compensating for the losses occured by the other party. Thoroughly review your document, and make payment. 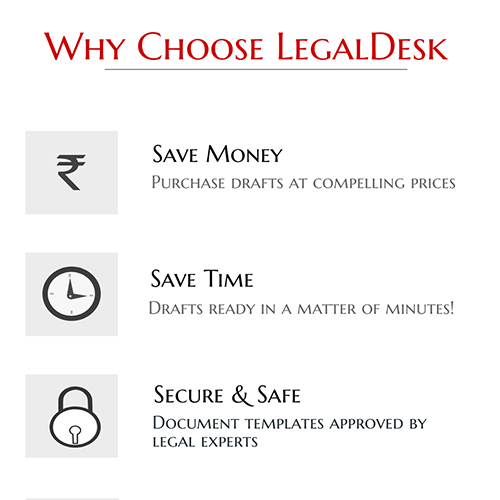 You can either print it yourself or use LegalDesk’s service to print the document on stamp paper and deliver to you at a nominal fee.